There has been a lot of interest recently in an upcoming series of lunar eclipses that begins April 15. These are usually described as "four blood moons" and taken by some to prophesy upcoming disasters. This NASA graphic shows the months with total lunar eclipses between April 2014 and September 2015. This tetrad of total lunar eclipses features eclipses on April 15, Oct. 8, April 4, 2015 and Sept. 28, 2015. 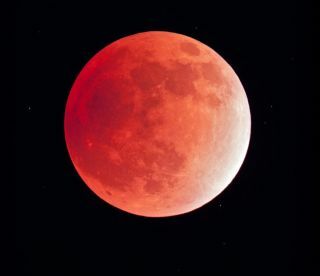 The total lunar eclipse of April 15 will begin a so-called tetrad series of eclipses that is making the rounds online as a potential harbinger of doom, due in part to a recent book on the four blood moons that makes the dubious claim. A lunar eclipse is something quite different. It occurs when the moon passes through the Earth's shadow. The Earth's shadow consists of two parts: a dark inner core called the "umbra," and a lighter outer part called the "penumbra." Rather than being truly dark, the inner shadow is usually tinted orange or red by light passing through the ring of atmosphere surrounding the Earth. Depending on the atmospheric conditions on Earth in the band of atmosphere through which the sun's light is passing, the umbra may take on a range of colors from light coppery-red to almost total black. The light illuminating an eclipsed moon is coming from thousands of sunsets and sunrises around the Earth. During some eclipses, these sunsets and sunrises are clear, and much light passes through; during others, clouds may block the light, causing a dark eclipse. On rare occasions, the light reaching the moon is exactly the color of blood, but there is no way of predicting this in advance. So there are no grounds to call any particular lunar eclipse a blood moon until it actually shows its color. Sometimes the moon only dips slightly into the central shadow, and it produces a partial lunar eclipse. One of these occurred last year, on April 25. The rarest of all lunar eclipses are those in which the moon passes through the darkest part of the shadow, a true total lunar eclipse. This last happened on Dec. 10, 2011. The total lunar eclipse of October 8 2014. What is unusual about this month's lunar eclipse is that it is the first of a series of four total lunar eclipses in a row. Called a tetrad, such a series of four total eclipses in a row is a fairly rare event. The last such series happened in the years 2003 and 2004. It will only occur seven more times in the current century. So while a tetrad of total lunar eclipses is somewhat rare, it is not extraordinarily so, and probably nothing to make a fuss about. After all, the only thing that happens during a lunar eclipse is that the moon spends a couple of hours passing through the Earth's shadow, hardly something to be concerned about. Unfortunately, there are still many superstitious people in the world. Such is the case in the book "Four Blood Moons: Something Is About to Change" (Worthy Publishing, 2013) by John Hagee, which suggests a link between the new total lunar eclipse tetrad and biblical prophecy about the end times. The total lunar eclipse of April 4 2015. Associations between "disastrous" events and normal astronomical events are all fabrications of the human mind, as people attempt to find explanations for why disasters affect them. Because of the Internet and cable news channels, people now hear reports of disasters from around the world, including earthquakes, tsunamis and volcanic eruptions, which they never would have been aware of in the past. It's almost inevitable that something bad will happen right after an eclipse or a visit from a comet. As an ardent skywatcher who derives much pleasure from beautiful events like lunar eclipses, it saddens me that there are "prophets of doom" in the world who view these life-enriching events as portents of disaster. The good news about these forthcoming lunar eclipses is that all four will be visible to most skywatchers in North America. I hope that you will manage to observe one or more of them, and share their beauty with your friends. The eclipse on April 15 will require most North Americans to stay up into the wee hours of the morning, but it will be well worth it.